It is a requirement of your Agreement, that the goods are protected against Theft and Accidental Damage. We can arrange Theft & Accidental Damage Cover for £1.12 per week. It is a requirement that products purchased on a credit agreement are insured. We can offer Theft and Accidental Damage Cover for £1.12 per week. Make every watching moment as perfect as can be with the Toshiba 49" LED TV. Never miss our on great showings again because this TV brings a spectacular 4K resolution with upscaling technology that improves HD and Full HD content to 4K, it offers breath-taking visuals no matter what you’re watching. Further improved by Dolby Vision HDR, the picture is perfect for immersing you within the show. 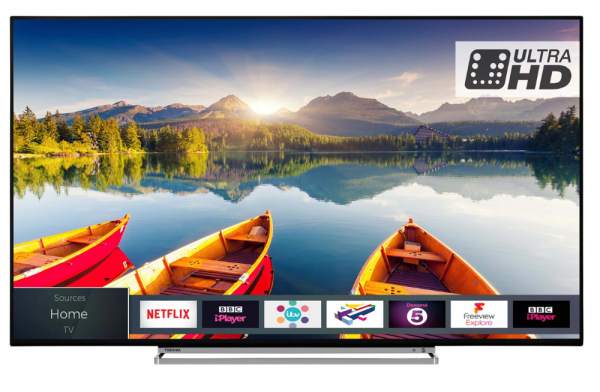 This Smart TV offers many services too and with Freeview HD, Freeview Play and Alexa compatibility, the TV world will be at your feet. This TV would be perfect for your home.